Hey everyone! 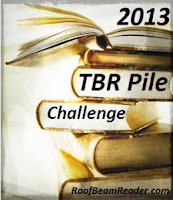 For the past two years I have participated in RoofbeamReader's TBR Pile challenge. This year will be another year that I try to meet the goal of reading and reviewing twelve books that have been on my TBR Shelf for over a year, so nothing published in 2012. There are quite a few for me to choose... the first year I read five and reviewed two. This year I did a jut about as good, reading and reviewing four. The list for my 2013 goal (third times a charm, eh?) has to be up and linked by December 31st, so I scrambled through my shelves to come up with my official 2013 list (with two alternates in case some are DNFs). This is the third year in a row I have put this on this list! I really want to read this before the movie comes out. This is the second time on the list. I have this one in my possession so it shouldn't be too hard to do, hopefully. This one is from my literal TBR shelf, proudly displayed in my living room. Another one from the Border's blowout from oh so many years ago. My sister has been on me to read this for forever it seems. This is the second year for this one. Another book I've been trying to read. I actually almost read it last year. Once I read this I feel like all of you can breath a collective sigh of relief. I've been meaning to read more by her for a while now. Another author I have been meaning to try for ages. It's been on my TBR shelf on goodreads since 2009. I've been wanting to read it for at least a decade now. It'll be great to finally read it! I do hope you get to Pride and Prejudice! You will thank yourself once you do! 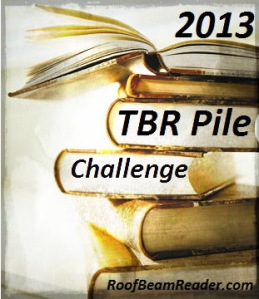 I would consider joining this challenge, but I never read the ones from LAST year! So...that will be my challenge! Best of luck! Yeah, I only read a few last year. I started off so well too... alas! Third time's a charm. Hi, Julia - Welcome Back!! I finished in 2010 & 2011, but it looks like I'll only make 11 of 12 for 2012! Oh well.. that's pretty darn close, and with school/work, etc., I'm okay with it. "Winning" is great! (Especially since it means an entry into the prize - but I'm not eligible for my own giveaway Lol), but I think making any progress is awesome. I'm loving your list... Ender's Game is amazing, please do get to that one (even though I can't stand the author)! 1984 is also incredible. I have owned Divergent since its release and still haven't read it. :*( Pride and Prejudice MIGHT be the "best" novel of all-time. I wasn't a fan of Stardust, but a lot of people love it. The others - I don't know! I'll wait and see what you think about them. Looking forward to your thoughts. Good luck!